This page is about the Russian fighter Yak-9U. For other uses, see Yak-9 (Family). The Yak-9U is a rank IV Soviet fighter with a battle rating of 4.0 (AB), 4.3 (RB), and 5.0 (SB). It was introduced in Update 1.37. The Yak-9 was a Soviet single-engine fighter of the WWII era. It was the first combat aircraft designed by Alexander Yakovlev's construction bureau. The most mass-produced Soviet fighter of the war, it remained in production from October 1942 to December 1948, with a total of 16,769 built. The Yak-9 was a further modification of the Yak-1 and Yak-7B. In its core design, it was a redesign of the Yak-7. With few external differences, Yak-9 was at the same time much more advanced internally. This is not unexpected, as almost two years of design and combat experience of the Yak series went into the Yak-9. Also, at the time aluminium was in much greater supply than it had been two years previously at the start of the war. Amongst other things, the use of metal allowed the plane’s weight to be significantly reduced, meaning that more fuel could be stored and that the aircraft could be equipped with more powerful armament and more specialized equipment. The Yak-9U is a redesign of the Yak-9. 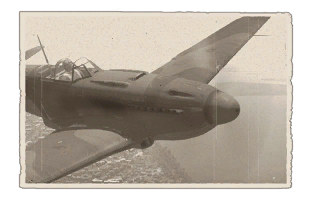 The Yak-9U entered in service in 1943, less than an year before the Yak-3 (even if the Yak-3 in before the Yak-9U in the Tech Tree) and has the same armament (2 x Berezin UB (12.7 mm) 12.7mm with 170 rounds per gun and 1 x ShVAK (20 mm) with 120 shells). The Yak-9U is faster and more resistant, but also heavier. The Yak-9U is an up-engined Yak-9 equipped with the M-107A engine. It sports competitive speed, far above average turning and roll abilities, good acceleration, a high dive limit (by USSR standards), and keeps nice and crisp controls from speeds as low as 250 km/h to 750 km/h. 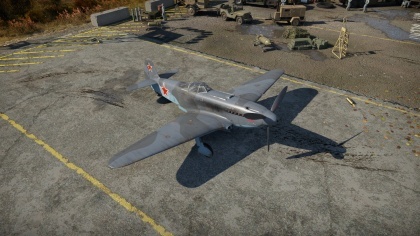 At 4.3 BR, it is arguably the most underestimated vehicle rank-for-rank in the game and is often skipped by players who view it as just another Yak-9. Unlike previous Yak-9s equipped with the VK-105PF engine, the Yak-9U gets a significant upgrade in the form of its M-107A engine (which also happens to be the engine utilized by the premium Yak-3 (VK-107) and the later Yak-9P/UT). As such, the Yak-9U is one of the fastest planes at sea level at 4.3 and retains excellent performance up to ~6 km where it can effectively engage higher-speed and faster climbing American and German planes, respectively. This, combined with the excellent handling and turn-fighting qualities allow the Yak-9U to effectively dictate any engagement- a pilot can turn-fight Bf 109s and P-47s with ease while having the capability to outrun slower yet more maneuverable vehicles such as the Spitfire. At sea level, the Yak-9U can catch most, if not all, planes at 4.3 BR, including the P-47 and P-51D. Beware, however, as the Yak airframe isn't particularly durable in a dive and will rip at speeds above 750 kph IAS (indicated airspeed). Thankfully, forcing an opponent down low effectively seals their fate as you and your team perform optimally at low altitude. 64 mm Bulletproof glass in cockpit front and rear.